Ten years ago, SMBs were just beginning to understand the need for and value of building web sites and storefronts. Today, SMBs are at a similar point when it comes to building mobile web sites and enabling mobile transactions. Why is this important? 4.8 billion users browse the web via a mobile device compared to 1.7 billion users who browse the web via other means, such as a laptop of PC (source: ITU, October 2010). Our recently published SMB Group market study, “2010 Small and Medium Business Mobile Solutions Study,” reveals that SMBs understand the importance of mobile friendly websites and plan to invest in a mobile web presence in order to help fuel their growth. In the very small businesses (1-19 employees) segment, only 11% have some mobile web presence, while in companies with more than 500 employees, 44% have created a mobile-friendly site. With interest and adoption of smartphones, tablets and mobile applications exploding, both small and medium business have very aggressive plans to ramp up activity and functionality on the mobile web site front. These businesses view mobile web sites as a key mechanism to attracting new customers, improving customer service and retention, and growing revenues. From an industry perspective, financial services/banking and professional services firms are taking the lead in deploying mobile web sites today. Going forward, retail, non-governmental organizations (NGOs) and education have very aggressive plans to establish a mobile web presence within the next 12 months. Many startups are choosing to start by developing their web presence through a mobile design paradigm first, from which they can then create a traditional web site. What Information and Transactions are SMBs Offering and Planning For on Their Mobile Web Sites? The most common types of information that SMBs with mobile web sites provide today include business contact information, available from 79% of SMBs’ mobile web sites; product and service information, offered on 71% of these sites; operating hours, listed by 65%; location applications, available from 60%. SMB use of mobile web sites for transactions is more nascent, but is picking up steam. Today, 28% of SMBs with mobile web sites offer customers capabilities to schedule appointments or make reservations; 10% use mobile advertisements; and 8% mobile coupons. SMBs that don’t currently offer these capabilities have very aggressive plans to ramp up these services in 2011–up to 53% for certain functions. High-growth and market leading SMB companies already have a mobile web-presence or are planning one in the next 12 months. In addition to this, depending on the industry, these SMBs are also very aggressively looking at enabling mobile transactions on their mobile websites. With upwards of 29 million smartphone users and 3 to 4 million tablet users, SMBs see the urgency of having a mobile web presence. 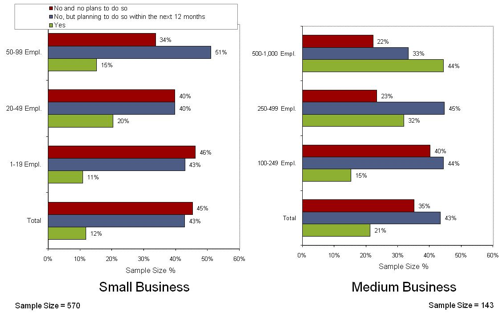 More information and a Table of Contents is available for this study click here: 2010 Small and Medium Business Mobile Solutions Study.